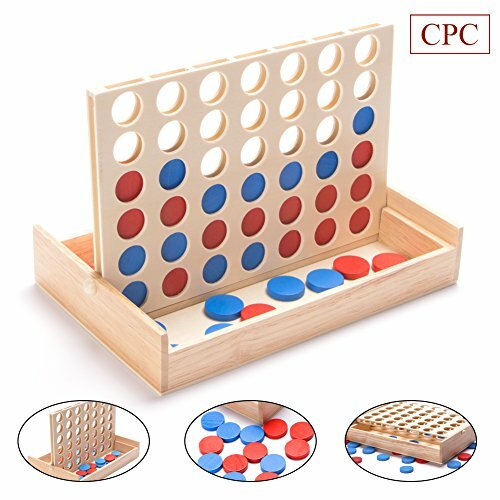 The family game contains 42 chips (21 red and 21 blue) with game board and game instruction card, made of nature rubber wood, harmless and durable. A perfect travel game, lightweight, all-in-one and folding designs makes it easy to storage and carry, you can have fun anywhere you want! The best educational toy, helps you to develop intelligence of your kids ,improves their ability of thinking and operation while have fun. The player who gets 4 chips in a horizontal, vertical or diagonal row first, wins the game. Simultaneous the players have to avoid this with their opponent whilst each player put a disc alternately into the frame. Warning: not suitable for children under the age of 3 years. Small parts! Choking hazard.